After starring alongside Christopher Walken in the Super Bowl LII commercial for Bai, Justin Timberlake returns to the small screen in a new ad for the low-calorie soft drinks brand, announcing, during a fake news broadcast, his invention: “Braspberry”. The 30-second spot, titled “This Just In,” opens with an anchorman presenting breaking news. “This just in: Bai has five calories and no artificial sweeteners,” he says, while in the meantime, an onscreen line reads “Bai is good for you and tastes amazing.” The newscaster then drops a word play, saying “This Justin (referring to Timberlake, who’s next to him, in the studio) keeps putting blueberries inside of raspberries.” The message on the ticker changes, informing that “Timberlake puts fruit inside other fruit.” “Braspberry,” the artist says, holding a raspberry with a blueberry inside of it. 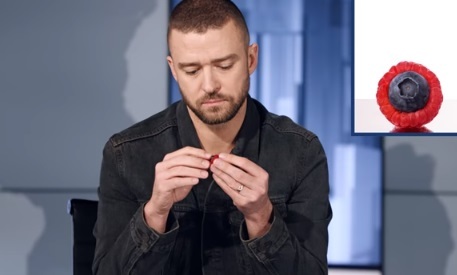 “Called it braspberry,” he reveals The latter, however, decides to keep it professional and say “Those look delicious”, which makes Timberlake ask him to try it. Even if he was confronted with a polite refusal, Timberlake keeps insisting until he almost manages to put the fruit into the man’s mouth. The commercial ends with Timberlake saying the brand’s tagline, “5 Calories, No Artificial Sweeteners, and Tastes Amazing”. The pop star became Chief Flavor Officer (aka spokesperson) for Bai in October 2016, when he also became an investor. A few months ago, he shared his fruity creation throuh a short video on Instagram, saying “Is it a coincidence that the blueberry fits in the raspberry perfectly? I think not”. Founded in 2009 in Princeton, New Jersey, the beverage company produces, besides the line of original “Bai Antioxidant Infusion” drinks, a “Bubbles” line of products that include sparkling water, a “Black” line of products that mimic popular soda flavors, a “Cocofusions” line of products that feature coconut water concentrate, and a “Supertea” line of products that feature real brewed teas.